Mini chiller is used for some special industry, like laboratory testing, laser cutting,welding machinery, MRI medical industry, Led industry, UV chiller industry, chillers for these industries can precision control the working temperature by adjusting the chiller controller panel to achieve the purpose. Top brand mini chiller adopt recent high technology, using Sanyo or Danfoss compressor, stainless steel water pump, finned condenser and shell and tube or plate type heat exchanger as main spare parts to ensure high quality. 2, Cooling air inlet/outlet temperature 30℃/38℃. 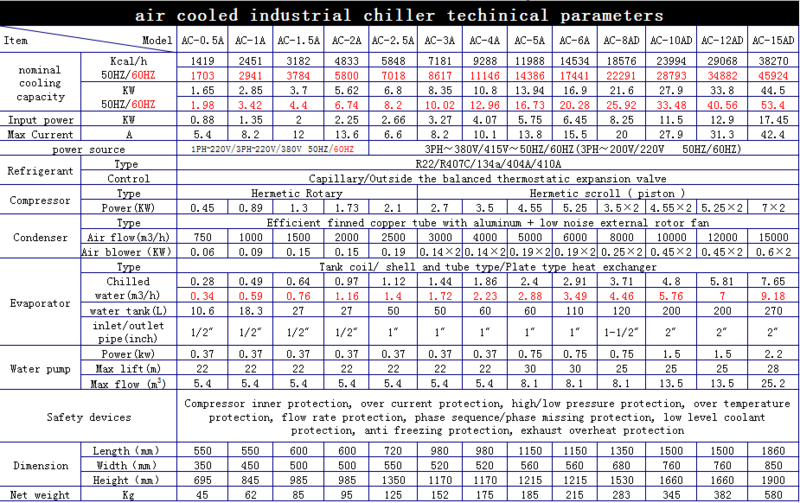 Note: Cooling capacity of R407C unit will be 5% lower than R22 unit. We reserve the right to modify the specification without further notice.